Sheilacakes: Halloween with Hershey's Review! I can’t believe that it’s almost time for Halloween. We got our pumpkins yesterday and we are getting excited about trick or treating. Noah keeps talking about going trick or treating and dressing up. He is definitely like his momma and loves candy. I do limit his candy consumption though. The best part of Halloween to me is the candy. I don’t care for scary movies and that is one of the things I dread when it comes to Halloween time is that there are scary movies on. I am the biggest wimp when it comes to scary stuff. I used to get so excited when I would go Trick or Treating, hello free candy! Any child’s dream come true right? I had the opportunity to try out some of Hershey’s Halloween candies. They have a few new mixes out there. I think that the success of a good trick or treat bowl is the mix of candy you have and none of those little orange and black wrapped peanut butter things. I was lucky enough to receive the mix of Kit-Kats, York Peppermint Patties, Whoppers and Mr. Goodbars. I think that is a great assortment because I love York Peppermint Patties, I have claimed those for my own. Noah has been enjoying the Kit Kats. He has actually been sneaking them. He can’t open them too well so he asks me to and gets busted. Kit Kats remind me of my Grandpa Jim because that was his favorite candy. We would bring him one when we would walk to the store. I really like Kit Kats too and I have had one or two. My mom loves Mr. Goodbars which I will share with her. I love Whoppers too. Yes I am a candy junkie. I always have been. I also received some Hershey’s Cookies n Crème bars those look good too. I love that these are all fun sized. It helps when you are a parent and are trying to limit your child’s candy intake or just want a little snack. 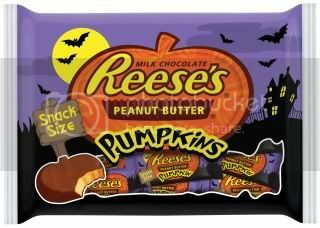 My favorite Halloween candy is Reese’s pumpkins hands down. You don’t normally get those from trick or treating although I wish we did. I buy some of those every year. I love any of the Reese’s holiday shaped candy. They have so much more peanut butter in them it just makes them so good. Maybe it is because you can only get them at certain times of the year but that is top on my Halloween candy list. So, as you are preparing your little goblins for Halloween in between your carving pumpkins, buying costumes, and making Halloween treats. Don’t forget to pick up some Hershey’s Candy for your trick or treat bowl at your local store and some extra for you. You know, so you don't run out. It just might make your house the most spookatacular house in the neighborhood. You can also check out a bunch of cool ideas to enhance your Halloween at the Hershey’s Celebrates Website. There you can find more information on Hershey’s Halloween products, as well as costume ideas, spooky screensavers, desktop wallpapers, delicious recipes, craft activities and party invitations. Thank you to Hershey’s who sent me some complimentary Halloween Candy to try out and review. I had such a hard time picking out candy to hand out this year. So many different assortments to choose from - but that's not necessarily a bad thing!